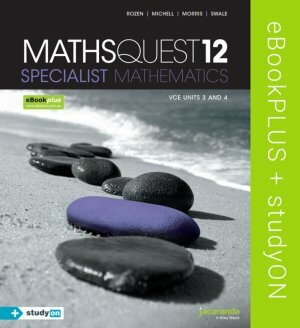 Maths Quest 12 Specialist Mathematics VCE Units 3 and 4 eBookPLUS with studyON VCE Specialist Mathematics Units 3 and 4 (Online) provides comprehensive coverage of the new VCE Study Design for 2016-2019. It includes Jacaranda’s unique exam preparation tool, studyON, which has been fully integrated with the text to maximise every student’s opportunity for exam success. • studyON VCE Specialist Mathematics Units 3 and 4 is fully integrated with the student text. studyON is Jacaranda’s unique study, revision and exam preparation tool, containing all past VCAA exam questions from 2006. This resource is a comprehensive digital-only product that includes studyON VCE Specialist Mathematics Units 3 and 4.
studyON for Units 3 and 4 is a comprehensive study, revision and exam preparation tool that delivers proven learning outcomes through a range of interactivities, videos and past VCAA exam questions.